Welcome to Green Country Dressage. The home of dressage in North Eastern Oklahoma. GCC is hosting 7 Schooling Shows and Schooling Show Championships for 2019! ****GCC was proud to present Adult Camp with Janice Dulak, March 9-11, 2018! Janice is a nationally renowned Dressage Pilates Instructor! organizing that made this event a success! GCC is hosting 5 schooling shows and schooling show championship for 2018! Click here to download 2018 Schooling Show Series Prize List! 2018 GCC Year End Awards Program! Don't miss your chance to get a year end award from GCC! Download the PDF to be informed of program rules, requirements, awards offered, etc! 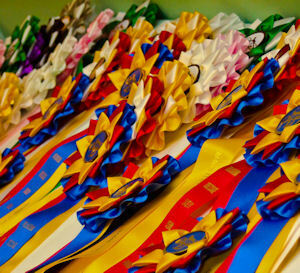 Know what GCC shows and private barn shows count towards awards! Click here to download awards program! GCC Juniors! Win the Jaime Orban Perpetual Memorial Award for 2018!